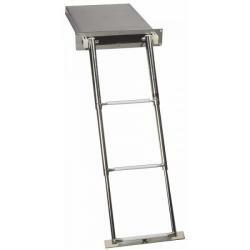 Stairs & Ladders | Exalto Emirates LLC. 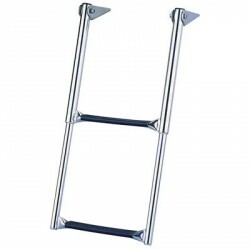 &bull; Steps - Fold out and over, telescope down easily&nbsp;&nbsp; &nbsp;&bull;&nbsp;Compact stowage - Steps fold over flat on platform&nbsp; &nbsp;&bull;&nbsp;Flat poly treads for increased comfort&nbsp; &nbsp;&bull;&nbsp;Securing strap included&nbsp; &nbsp;&bull;&nbsp;Standard folding mounting brackets&nbsp; &nbsp;&bull;&nbsp;Rated to 124.7kg boarding weight&nbsp; &nbsp;&bull;&nbsp;304 stainless steel&nbsp; &nbsp;&bull; Fasteners not included&nbsp;&nbsp; To select the proper length of ladder choose one that allows at least 2 steps under water when ladder is deployed. 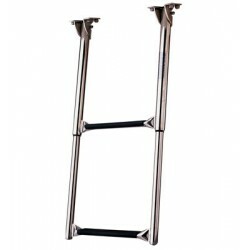 &bull; Steps telescope down easily&bull; Ladder slides up, under platform for stowage&bull; Flat poly treads for increased comfort&bull; Mounting hardware and securing strap included&bull; Self-locking angled support bracket&bull; Rated to 124.7kg boarding weight&bull; 304 stainless steel&bull; Fasteners not includedTo select the proper length of ladder choose one that allows at least 2 steps under water when ladder is deployed. 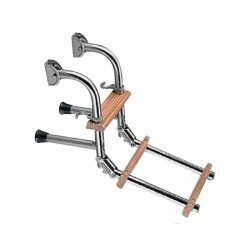 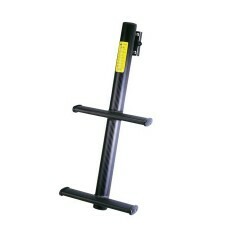 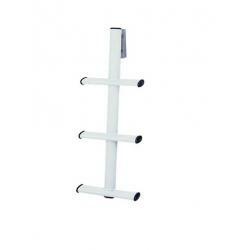 &bull; For use on small boat transoms&mdash;mounts 34 x 17cm area&bull; Folds down for easy boarding&bull; Fits most angled or curved transoms&nbsp;&bull; Stainless steel fasteners and securing strap included&nbsp;&bull; Durable 1&rdquo; (3cm) diameter anodized aluminum tube &nbsp;&bull; Comfortable contour black traction molded poly steps&nbsp; To select the proper length of ladder choose one that allows at least 2 steps under water when ladder is deployed. 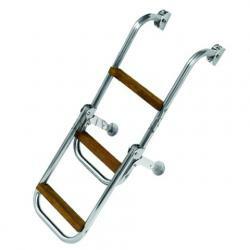 Besenzoni ladders are all manufactured using high quality materials such as stainless steel, Carbon Fibre and teak making themextremely durable and reliable. 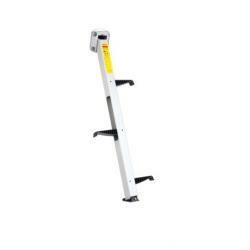 Many different configurations are also available from manual drop in models to fully automatedconcealed hydraulic letterbox models which can rotate once extended, the choice is extensive. 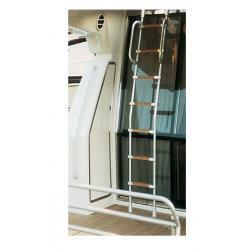 For larger yachts both fixed androtating ladders have the option of self adjusting steps to optimise safety whilst boarding and proximity sensors can be fitted to letthe captain know if the ladder is deployed.